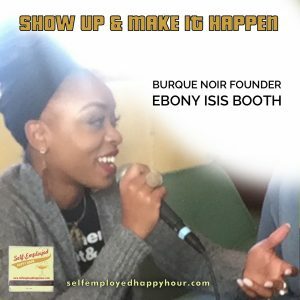 We’re back with our second episode of 2018, featuring a fantastic conversation with Burque Noir founder Ebony Isis Booth! Peri and Eph Sharpe chat with Ebony about how she created a showcase for Black performers in Albuquerque, and how she balances the many different identities — poet, organizer, marketing pro, auntie-mom, holder of the mic — that make her who she is. You can stream the podcast below, or subscribe at iTunes or Stitcher. Be sure to Like our Facebook page for updates, previews and a like-minded community of self-employed peeps! Audio clip courtesy of Ebony Booth. Segment music by Eph Sharpe.